What kind of filling for your sofa cushions? One thing that most people care about is how the cushions feel to them – do you like to sink down into the cushions or you like a denser, more supportive cushion? Either way, the cushions are important. The density or weight per cubic foot. The higher the number, the more it weighs. Foam that has a density of 1.8, for example, contains 1.8 lbs. of foam per cubic foot and foam that has a density of 2.5 would have 2.5 lbs of foam per cubic foot. Density for sofa cushions ranges between 1.6 and 5 or even 6. The second measurement tells you the firmness of the foam (called the IFD – the Indentation Force Deflection). The IFD is the feel of the cushion, and tells you how much weight it takes to compress the foam by one third. The lower IFD will sit softer. The higher IFD will sit firmer. IFD numbers range between 15 to 35. What many people don’t realize is that the density and firmness numbers go hand in hand – you can’t look at one without the other. They are expressed as density/firmness, for example: 15/30 or 29/52. The first, 15/30 means that 1.5 pounds of foam per cubic foot will take 30 pounds of weight to compress the foam 33%. The second example means that 2.9 pounds per cubic foot of foam will take 52 pounds of weight to compress the block 33%. After choosing which foam to use, it is then wrapped with something to soften the edges – for example, Dacron or polyester batting, cotton or wool batting or down/feathers. Lowest quality sofas will not even wrap the (low quality) foam; higher quality sofas have cushions that are made from very high quality foam and wrapped in wool or down. But as you will see, the foam is itself very problematic. Polyurethane foam is so flammable that it’s often referred to by fire marshals as “solid gasoline.” When untreated foam is ignited, it burns extremely fast. Ignited polyurethane foam sofas can reach temperatures over 1400 degrees Fahrenheit within minutes. Making it even more deadly are the toxic gasses produced by burning polyurethane foam – such as hydrogen cyanide. The gas was also implicated in the 2003 Rhode Island nightclub fire that killed 100 people, including Great White guitarist Ty Longley, and injured more than 200 others. Tellingly, a witness to that fire, television news cameraman Brian Butler, told interviewers that “It had to be two minutes, tops, before the whole place was black smoke.” Just one breath of superheated toxic gas can incapacitate a person, preventing escape from a burning structure. Therefore, flame-retardant chemicals are added to its production when it is used in mattresses and upholstered furniture. This application of chemicals does not alleviate all concerns associated with its flammability, since polyurethane foam releases a number of toxic substances at different temperature stages. For example, at temperatures of about 800 degrees, polyurethane foam begins to rapidly decompose, releasing gases and compounds such as hydrogen cyanide, carbon monoxide, acetronitrile, acrylonitrile, pyridine, ethylene, ethane, propane, butadine, propinitrile, acetaldehyde, methylacrylonitrile, benzene, pyrrole, toluene, methyl pyridine, methyl cyanobenzene, naphthalene, quinoline, indene, and carbon dioxide. In conclusion, the benefits of polyfoam (low cost) is far outweighed by the disadvantages: being made from a non-renewable resource (oil), and the toxicity of main chemical components as well as the toxicity of the flame retardants added to the foam – not to mention the fact that even the best foams begin to break down after around 10 – 12 years of “normal use”. The fact that California has amended the old law that required fire retardants in polyurethane foam doesn’t affect the fact that in a fire, the toxic gasses released by the foam (such as hydrogen cyanide) would incapacitate the occupants of a house in just a few minutes. It’s made from soybeans, a renewable resource: This claim is undeniably true. But what they don’t tell you is that this product, marketed as soy or bio-based, contains very little soy. In fact, it is more accurate to call it ‘polyurethane based foam with a touch of soy added for marketing purposes’. For example, a product marketed as “20% soy based” may sound impressive, but what this typically means is that only 20 % of the polyol portion of the foam is derived from soy. Given that polyurethane foam is made by combining two main ingredients—a polyol and an isocyanate—in approximately equal parts, “20% soy based” translates to a mere 10% of the foam’s total volume. In this example the product remains 90% polyurethane foam and by any reasonable measure cannot legitimately be described as ‘based’ on soy. If you go to Starbucks and buy a 20 oz coffee and add 2-3 soy milk/creamers to it, does it become “soy-based” coffee? It reduces our dependence on fossil fuels: According to Cargill, a multi-national producer of agricultural and industrial products, including BiOH polyol (the “soy” portion of “soy foam”), the soy based portion of so called ‘soy foam’ ranges from 5% up to a theoretical 40% of polyurethane foam formulations. This means that while suppliers may claim that ‘bio foams’ are based on renewable materials such as soy, in reality a whopping 90 to 95%, and sometimes more of the product consists of the same old petro-chemical based brew of toxic chemicals. This is no ‘leap forward in foam technology’. It is true that the energy needed to produce soy-based foam is, according to Cargill, who manufactures the soy polyol, less that that needed to produce the polyurethane foam. But the way they report the difference is certainly difficult to decipher: soy based polyols use 23% less energy to produce than petroleum based polyols, according to Cargill’s LCA. But the formula for the foam uses only 20% soy based polyols, so by my crude calculations (20% of 50%…) the energy savings of 20% soy based foam would require only 4.6% less energy than that used to make the petroleum based foam. But hey, that’s still a savings and every little bit helps get us closer to a self sustaining economy and is friendlier to the planet. My concern with the use of soy is not its carbon footprint but rather the introduction of a whole new universe of concerns such as pesticide use, genetically modifed crops, appropriation of food stocks and deforestation. Most soy crops are now GMO: according to the USDA, over 91% of all soy crops in the US are now GMO; in 2007, 58.6% of all soybeans worldwide were GMO. If you don’t think that’s a big deal, please read our posts on these issues (9.23.09 and 9.29.09). The debate still rages today. Greenpeace did an expose (“Eating Up The Amazon”) on what they consider to be a driving force behind Amazon rainforest destruction – Cargill’s race to establish soy plantations in Brazil. So what’s a poor consumer to do? We think there is a viable, albeit expensive, product choice: natural latex (rubber). The word “latex” can be confusing for consumers, because it has been used to describe both natural and synthetic products interchangeably, without adequate explanation. This product can be 100% natural (natural latex) or 100% man-made (derived from petrochemicals) – or it can be a combination of the two – the so called “natural latex”. Also, remember latex is rubber and rubber is latex. Natural latex – The raw material for natural latex comes from a renewable resource – it is obtained from the sap of the Hevea Brasiliensis (rubber) tree, and was once widely used for cushioning. Rubber trees are cultivated, mainly in South East Asia, through a new planting and replanting program by large scale plantation and small farmers to ensure a continuous sustainable supply of natural latex. Natural latex is both recyclable and biodegradeable, and is mold, mildew and dust mite resistant. It is not highly flammable and does not require fire retardant chemicals to pass the Cal 117 test. It has little or no off-gassing associated with it. Because natural rubber has high energy production costs (although a smaller footprint than either polyurethane or soy-based foams ), and is restricted to a limited supply, it is more costly than petroleum based foam. Synthetic latex – The terminology is very confusing, because synthetic latex is often referred to simply as “latex” or even “100% natural latex”. It is also known as styrene-butadiene rubber (SBR). The chemical styrene is toxic to the lungs, liver, and brain; the EPA finds nervous system effects such as depression, loss of concentration and a potential for cancer(4). Synthetic additives are added to achieve stabilization. Often however, synthetic latex can be made of combinations of polyurethane and natural latex, or a combination of 70% natural latex and 30% SBR. Most stores sell one of these versions under the term “natural latex” – so caveat emptor! Being petroleum based, the source of supply for the production of synthetic latex is certainly non-sustainable and diminishing as well. Natural latex is breathable, biodegradeable, healthier (i.e., totally nontoxic, and mold & mildew proof) and lasts longer than polyfoam – some reports say up to 20 times longer. What does the new TB117-2013 mean to you? California has approved a new flammability standard for residential furniture that is receiving widespread praise among environmentalists. But we’d like you to examine, with us, some details about the new standard that you’ll need to know to keep you and your family safe from these extremely toxic chemicals. California is the only state in the U.S. with a mandatory flammability standard for residential furniture. The original law, TB117, was passed with all the good will in the world – to protect people from dying in house fires by giving them time to escape. But as is often the case, there were unintended consequences – we have found that the fire retardant chemicals are linked to cancer, developmental problems, reduced IQ and impaired fertility – and more. These chemicals both persist (i.e, last a long time) and bioaccumulate (i.e., are absorbed at a rate greater than that at which the substance is lost – leading to a risk of chronic poisoning) in human systems. And the final straw: ironically, the chemicals don’t protect us from fires – they just allow the material not to fail the flammability test. In actual fires, the materials do burn, and just as massively as untreated foam, and that releases toxic smoke into the air; one pundit has said that firefighters have more to fear from the smoke than from the actual fire. Recently, there has been growing pressure to change California’s “Technical Bulletin 117”, which required furniture manufacturers to inject flame retardant chemicals into the polyurethane foam used in all upholstered furniture sold in the state. (Please note: the law only pertained to filling materials.) Because California is such a huge market, this law has become a de facto national standard. This pressure was fueled by a series of articles in the Chicago Tribune entitled “Playing with Fire” (click here to read the articles) , and more recently by the HBO film, Toxic Hot Seat, both of which exposed the considerable health risks of flame retardant chemicals, as well as the attempts by the chemical industry to thwart attempts at reform. Why are flame retardant chemicals required in polyurethane foam? Answer: Because polyurethane is basically solid gasoline, which means it’s basically an accelerant. The old test required that it pass a test by withstanding an open flame for 12 seconds before igniting. Because this is impossible, the chemicals were added to prevent ignition. What makes the new TB117-2013 different is that the test methods have changed. Legislators decided to amend the manner in which flammability is measured. They reasoned that most house fires start from smoldering cigarettes, which cause the fabric to smolder and catch fire – not from within the cushion in the foam. They thought that upholstery cover fabrics play a more important role in fire behavior performance than filling materials – flames start on the fabric, not from deep within the cushions, so the best way to prevent the foam from igniting is to make sure that the surface materials do not smolder in the first place. So the new test did away with the 12 second open flame test and replaced it with a smolder-only test. In this test, a lighted cigarette (not an open flame) is placed on the surface of the furniture. If charring occurs which is 2 inches or less, the furniture is considered to pass. This is a much easier test to pass than the open flame test. So the new TB117-2013 enables foam manufacturers to reduce or eliminate flame retardant chemicals – but it doesn’t forbid their use. The new law was designed to enable manufacturers to eliminate the flame retardants, but if they choose to use them it’s not illegal. It’s up to manufacturers to decide how they plan to meet the new standard. Most fabrics used in upholstery today are synthetics or synthetic blends (natural fiber/synthetic). And synthetics are created from crude oil – so they too are basically solid gasoline. An accelerant. Fabrics can be fire retarded easily and cheaply, and it’s very commonly done. So although the foam manufacturers can (if they so choose) eliminate flame retardant chemicals in the foam, the burden of passing a smolder test now falls on the fabric. It seems to me that the flame retardant chemicals are now just going to be found in the fabrics rather than the foam. The new law was originally supposed to go into effect on July 1, 2014, but manufacturers, who said they “needed the additional times to deplete current supplies and effectuate the new regulatory changes” extended the new date to January 1, 2015. However, starting in January, 2014, manufacturers will be able to sell furniture with a “TB117-2013” tag – so consumers should make sure to ask whether the sofa or chair has been treated with flame retardant chemicals. Manufacturers are not required to disclose whether they use flame retardants or not, and few label their products. If you really want to be sure, the Center for Environmental Health can test foam to detect the presence of flame retardants. The tests only indicate whether certain elements are present, such as chlorine or bromine. If so, it is likely the foam was treated with flame retardants. If you want information on how to use this free service, click here. Even if the foam is tested and found not to contain flame retardants, that is by no means a clean bill of health for your sofa, because the fabrics may well contain flame retardants. And a TB117-2013 label on a piece of furniture is not a guarantee that there are no flame retardants used in the piece. And we think it’s pretty critical to add this final caveat – flame retardant chemicals are just ONE of the many chemicals which may be found in your fabrics. Textile production uses a lot of chemicals, most of which have toxicity profiles as equally unsavory as flame retardants: consider formaldehyde, perfluorocarbons (PFC’s), benzene, APEO’s, polychlorinated biphenyls (PCB’s) and Bisphenol A in synthetics, and heavy metals such as lead, mercury and cadmium. So to limit yourselves to eliminating flame retardant chemicals from the fabrics or furniture you live with – as wonderful as that is – means you’re not seeing the forest for the trees. Sofa cushions – foam, soy foam or latex? So we have produced the frame and put in the suspension system. Next in line are the cushions – something soft to sit on. The density or weight per cubic foot of polyurethane foam. The higher the number the more it weighs. Foam that has a density of 1.8 foam, for example, contains 1.8 lbs of foam per cubic foot and foam that is 2.5 foam would have 2.5 lbs of foam per cubic foot. 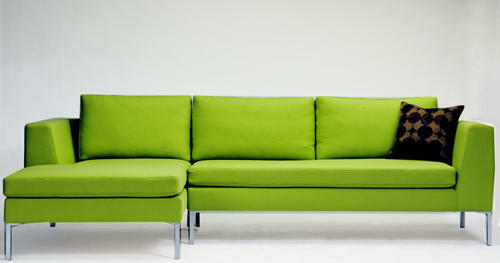 Density for sofa cushions ranges between 1.6 and 5 or even 6. What many people don’t realize is that the density and firmness numbers go hand in hand – you can’t look at one without the other. They are expressed as density/firmness, for example: 15/30 or 29/52. The first, 15/30 means that 1.5 pounds of foam per cubic foot will take 30 pounds of weight to compress the foam 33%. The second example means that 2.9 pounds per cubic foot of foam will take 52 pounds of weight to compress the block one third. The foam is then wrapped with something to soften the edges – for example, Dacron or polyester batting, cotton or wool batting or down/feathers. In conclusion, the benefits of polyfoam (low cost) is far outweighed by the disadvantages: being made from a non-renewable resource (oil), and the toxicity of main chemical components as well as the toxicity of the flame retardants added to the foam – not to mention the fact that even the best foams begin to break down after around 10 – 12 years of “normal use”. As with so many over hyped ‘green’ claims, it’s the things they don’t say that matter most. While these claims contain grains of truth, they are a far cry from the whole truth. So called ‘soy foam’ is hardly the dreamy green product that manufacturers and suppliers want people to believe. It reduces our dependence on fossil fuels: According to Cargill, a multi-national producer of agricultural and industrial products, including BiOH polyol (the “soy” portion of “soy foam”), the soy based portion of so called ‘soy foam’ ranges from 5% up to a theoretical 40% of polyurethane foam formulations. This means that while suppliers may claim that ‘bio foams’ are based on renewable materials such as soy, in reality a whopping 90 to 95%, and sometimes more of the product consists of the same old petro-chemical based brew of toxic chemicals. This is no ‘leap forward in foam technology’. Is there really a question as to which to buy? In an upholstered piece of furniture, the cushions need a filler of some kind. Before plastics, our grandparents used feathers, horsehair or wool or cotton batting. But with the advent of plastics, our lives changed. You will now commonly see polyurethane foam, synthetic or natural latex rubber and the new, highly touted soy based foam. In putting together this information on foams, I leaned heavily on a series of blog postings by Len Laycock (CEO of Upholstery Arts), called “Killing Me Softly”. It saddens me to have found out that Upholstery Arts is no longer selling furniture. In conclusion, the benefits of polyfoam (low cost) must be evaluated with the disadvantages: being made from a non-renewable resource (oil), and the toxicity of main chemical components as well as the toxicity of the flame retardants added to the foam. Next I would like to talk about those new soy based foams that are all the rage, but I don’t want to bite off too much. It’s a big topic and one that deserves its own post. So that’s going to be next week’s post!